It's been called one of the most amazing natural phenomena in the world, and if you live in these areas, you may get to see it. A huge amount of Monarch Butterflies are making their way south as winter approaches, and it’s one of the most amazing sights on the planet. Monarchs have annual migrations across North America that are famous for just how breathtaking they are. It beings in September and October and continues until they reach their destinations in November. They usually start north, in Southern Canada and the Northern United States. On the west side of the continent, they had south to California, while on the east side, they head for central Mexico. They will stay in those warmer areas throughout the winter, huddling together for warmth. Once spring arrives, they will begin their return flight in March, arriving back in their breeding grounds in July. Interestingly, no butterfly actually completes this round trip. 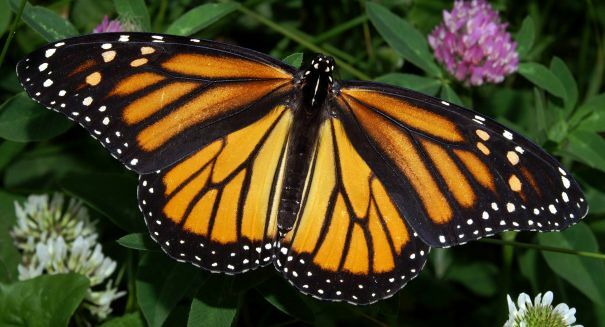 Instead, female Monarchs lay their eggs so that they can hatch and head north. A total of five generations are involved in one annual cycle. Stories of the Monarch’s migration have been the stuff of legends for millenia, with the people of Mexico tying the harvest of their corn crops with the arrival of these massive flocks of butterflies. During their migration, the butterflies will group together, and then huddle together once they reach their roosting sites. Sometimes, there are thousands of butterflies in just one location. However, the Monarchs are threatened, and scientists are seeing a dip in their numbers. Mainly it’s because the milkweed plant, which Monarchs rely on for food, is disappearing thanks to urban sprawl and herbicides. As a result, some groups have taken to planting milkweeds in order to protect the Monarchs and provide them with a place to lay their eggs.